The Salted Line A6xxx standard housing. Historically many surf photographers have been quick to dismiss water based photography due to the high costs associated with purchasing a high quality camera and expensive water housing. This cost could set you back anywhere between $4,000 to $10,000 for a full frame camera and housing setup. Fortunately with the availability of the affordable yet high performance Sony Alpha A6000 mirror-less camera (the highest selling mirror-less camera in history) and the recent release of Sea Frogs new Salted Line A6xxx water housing surf photography enthusiasts now have access to a feature packed setup with a surprisingly affordable price tag. With the rapid growth in the popularity of Sony's A6000 camera among surfer photographers the world over there has been a rapid increase in offerings by water housing manufacturers to meet this unprecedented demand and with the latest product offering being the Salted Line A6xxx range from Sea Frogs. Sony's A6000 camera rapidly became popular among surf photographers as it offered a high performance (24 megapixel) robust and compact camera with a fast shutter speed at a highly affordable price of around $800 AUD. The A6000 camera was especially popular with more price conscious hobby surf photographers and those transitioning from Gopro photography to DSLR. Salted Line A6xxx housing with two stage trigger and 6 inch dome port. So what is so different about the new water housing offering from Sea Frogs? Well to start with...the affordability. The newly released Salted Line A6xxx standard water housing comes in at an astoundingly low price of $297 USD ($398 AUD) for the standard water housing setup or for $397 USD ($533 AUD) with a two stage pistol grip. For $582 USD ($782 AUD) you can purchase the full package which includes a two stage pistol grip and a 6 inch dome port. This makes the Salted Line A6xxx option easily the most affordable setup on the market today and at $582 USD ($782 AUD) it is close to half the price of the next cheapest housing option being Liquid Eye's full setup priced at $1,056 USD ($1,435 AUD). This is great news especially for A6000 users as it is hard to justify purchasing a housing that costs 2-4 times the price of the camera itself. The manufacturer Sea Frogs is traditionally a Dive water housing manufacturer and this release represents their first foray into the surf water housing market. The release of their highly affordable feature packed product has created waves within the industry as in the past quality water housings have never come cheap. This great housing is compatible with all three variants of Sony's extremely popular A6 range being the A6000, A6300 and A6500 cameras thanks to a simple yet cleverly engineered conversion kit. I foresee Sea Frogs expanding their offerings in the near future to provide surf housings that cover the most popular cameras for surf photography such as the Sony A7 (apparently coming soon) or the Canon 5D ranges.... such a move would definitely shake up the surf water housing industry that's for sure. The original dive housing passed with flying colours in Central America. The heaviest waves in South America proved no problem for the Sea Frog's housing. But can a dive housing manufacturer successfully make the cross over to manufacture quality surf housings? We all know that the demands and requirements for a surf housing can be vastly different to that of a dive housing. Obviously using a water housing in calm dive conditions compared to large and powerful ocean swells/waves can present different requirements on the housing with the former placing intense impact related pressure on the water housing. Therefore any quality surf housing first and foremost will have to have a strong and robust design to meet the stringent demands of surf photography. Personally I had no major concerns regarding the challenges of the cross over as I have previously utilized Sea Frogs original standard dive housing as my go to surf housing for the past three years while journeying and capturing images of some of Central and South Americas heaviest and most dangerous waves. During my journey not once did I experience any issues with this housing whatsoever. The original dive housing proved to be fantastic for travel due to its low cost, robust attributes and light/compact nature. This housing did have it's short comings however such as no additional port options (making it compatible with only 3-4 lenses) and it did not have the option to use the view finder leaving the LCD screen as your only viewing option. I have to admit that I was thoroughly excited when I heard the news of Sea Frogs impending release of a water housing designed specifically for surf photography. Sea Frogs new housing would not only overcome the short comings of the older standard dive housing but it would also offer a host of extra features that we would normally only associate with top line highly expensive water housings. Sea Frog's original dive housing held up in trying conditions in the Galapagos Islands. The Salted Line A6xxx standard housing is available in both a black and white colour option (with more colour options on the way) and I have to admit that the white option looks very smart indeed as is very pleasing on the eye. One thing that really stood out for me is how solid and sturdy the quality of the build is. Weighing in at 1.3kgs the housing definitely has some weight behind it but this added weight translates directly to a very robust feel. Perfect news for the budding surf photographer. The standard housing is supplied with a removable port which is compatible with over 11 different lenses giving you vast options and variety to suit any conditions or shooting style. While the 6 inch dome port (which we will detail more later) can house nine additional larger lenses including some great high quality Carl Zeiss Sonnar lens options. Overall this gives you 20 different lens options from only two different port types, nice! Furthermore the Large Macro Port, Large Flat Port and the Small Marco Port give you five additional lens options. One fair criticism of the housing is that it is not currently compatible with with many of the popular small Fisheye options such as the Samyang/Rokinon 8mm f/2.8 Fisheye but rumour has it that a smaller dome port option designed specially for these lenses is currently in the pipeline with a release anytime now.... also good news. A really fantastic feature of this housing is that is comes with full button access and zoom controls (for certain lenses only) enabling you to toggle will all of the camera settings to your hearts content while in the water. Such full button access and zoom capability is not common place within the industry and is usually reserved for top line water housings. The buttons are easy to use, responsive and soft on the touch. However, just be careful not to bump the flash button as this will pop the flash up inside the housing which you cannot retract with out opening the housing. Accidentally triggering the flash can potentially ruin an epic session in the water...believe me I know this from some very painful experiences in the past. One tip to prevent this is to tape down the flash on the actual camera itself so it is more difficult to trigger it. The housing features a padded eye piece that gives you comfortable access to the view finder. If you prefer you also have clear LCD viewing access and there is even a removable sun shield to give you a clear and crisp view of the LCD screen if in heavy sunlight. There are four hooks on the outside of the housing to be utilised for attaching your wrist leash or tethering equipment such as a Gopro. 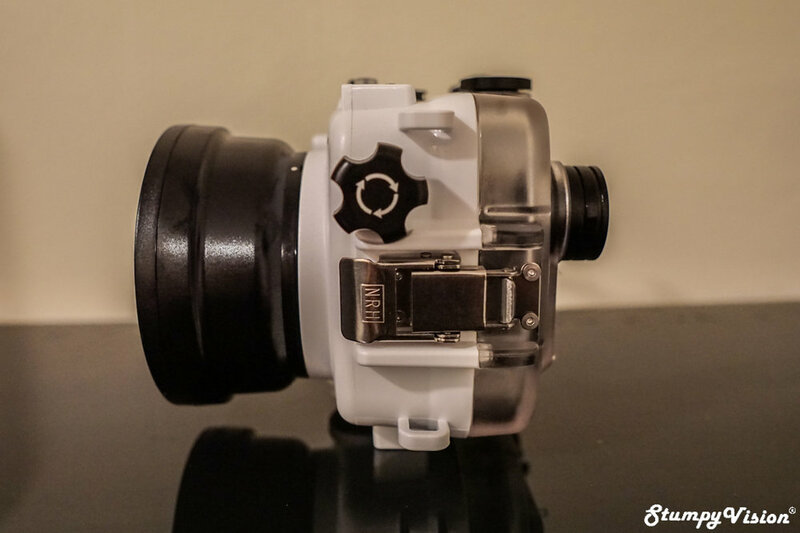 There is a cold shoe mount on the top of the housing that can be used to mount a Gopro (with a cold shoe adapter mount) or strobe equipment. Inserting and removing the camera from the housing is a simple task as the back-plate can be quickly removed by unlatching the two metal latches on the sides. This task can be completed in mere seconds compared to alternative screw mounted back plates offered by other housing manufacturers. View finder, LCD screen access, full button and zoom control....not bad huh? Another great feature of this housing is that it is buoyant (yes it floats) and if you were to somehow loose your housing in the water it would not sink to the depths to be lost to the world forever. The housing is rated to 60 metres which if you are a surf and dive photographer well you basically have all your needs met in one solution. On the bottom of the housing you will find two 1/4" -20 threaded holes which gives you the freedom to add additional equipment such as additional grips and accessories. One feature that the housing is perhaps lacking is a flash setup option ( well you can't have it all right? However it is compatible with strobes) although they could perhaps develop a flash option via the air vacuum pump entrance combined with the cold shoe fitting which would be cool..... perhaps some food for thought there. The housing arrived incredibly well packaged and the box includes an in-depth instruction manual, anti fog inserts, spare o-rings, silicone grease, a soft cleaning cloth and a basic wrist tether (which I definitely would not recommend for use in the surf). Salted Line 6 inch dome port with swap ring. Looks smart huh? The Salted Line A6xxx housing also has a six inch dome port option. The Dome Port retails for $225 USD ($302 AUD). The build is solid and robust but one feature that is maybe not desirable for surf photography is the wing like extensions. I assume these extensions are for reducing sun glare but also act as protection for the acrylic from hitting the sand/rocks on the sea floor etc. The wings tend to make the housing more bulky. Fortunately Sea Frogs now provide a 6 inch swap ring for just $33 USD ($44 AUD) to make the dome port more suitable for surf photography. The swap ring unfortunately pushes the price up a little for those who can't live with the wing like extrusions. What I really like about the dome port is it allows you to install a host of the larger top quality lenses such as the recently released Sigma 16mm 1.4 and a range of quality Sony Carl Zeiss Sonnar lenses. The Sigma 16mm 1.4 is widely regarded as one of the sharpest lens available for the Sony A6000 range. This Sigma lens is reputed to be as sharp as a tack and has excellent performance in low light. So in essence this dome port allows you to add this top quality lens to your arsenal to enable you to really push your surf photography to higher levels. 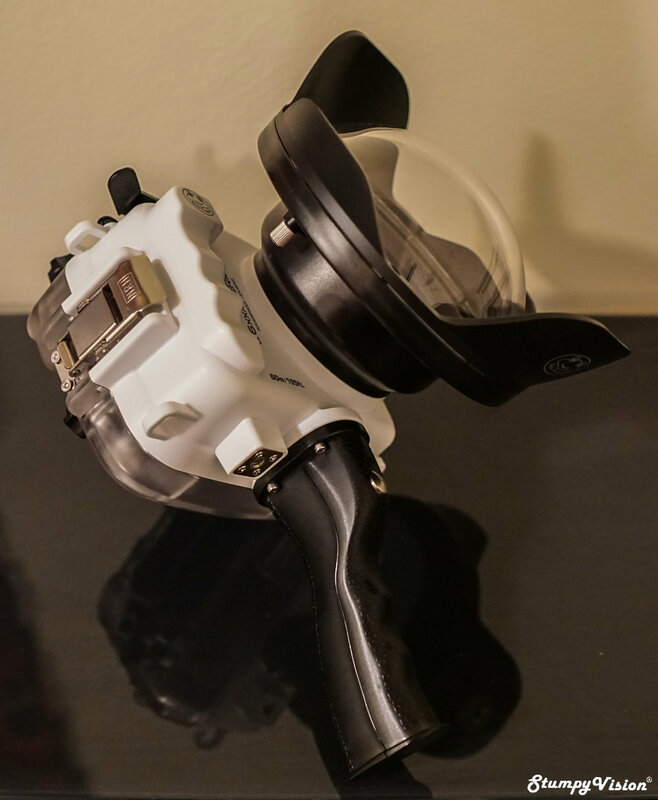 Sea Frogs are also set to release the new 8 inch dome port (pictured below) soon as well. More info will be provided on this as news comes to hand. 8 inch dome port pending release. There is a two stage trigger pistol grip available for the Salted Line A6xxx housing. The pistol grip is a steal for around $100 but it is only available as part of a package deal at this stage. The build is smart, robust, comfortable to grip and performs smoothly and perfectly with the camera. While not essential (the housing also has a shutter button) the trigger with give you good smooth control while shooting with the viewer finder and it will also enable you to shoot one handed which is essential when shooting surf photography in critical and heavy surf conditions. The trigger pistol grip could well prove the difference between blowing or nailing the perfect barrel shot. So there you have it, my review and first impressions of the new Salted Line A6xxx water housing! It is a fantastic high quality, feature packed and robust product without the hefty price tag one would normally associate with a quality surf water housing. The build quality is very sturdy and the design is very practical offering a large range of useful options for surf photography. I would highly recommend it to someone with a camera from the A6xxx range as I feel it does not make sense paying more for a housing than the actual camera is worth. I have recently taken the housing out for a test run (sneak peak photo below) and I will detail my findings in another article in the near future so please keep your eyes peeled. In the mean time I have compiled a summary table comparing the features and pricing of the Salted Line A6xxx water housing to the most popular water housing manufacturers on the market today. Aloha! All prices correct at time of writing.